An adult female mountain gorilla in Rwanda’s Volcanoes National Park. It’s tough to travel to Rwanda, as I did last summer, without being reminded of Dian Fossey, the primatologist portrayed on the big screen by Sigourney Weaver. She made a home there, in Volcanoes National Park, where many of the seven hundred mountain gorillas left on Earth live. Fossey and the gorillas are usually the second and third things outsiders mention about Rwanda. The first is the 1994 genocide, which killed more than one-tenth of the country’s population. It was a literal decimation, journalist Philip Gourevitch noted. I didn’t visit Rwanda for either of these, though I had always felt I should know more about both. Most of what I knew about Rwanda I had learned from the movies “Gorillas in the Mist” and “Hotel Rwanda.” I went to Rwanda because it was the farthest I could get from my home and American University, where I was a junior faculty member, after I would learn if my six-year bid for tenure was successful. Either way, I figured I would want to be a world away, celebrating or forgetting. Fossey set up her research center in the Rwandan section of the Virunga Mountains in 1967, and fought until her murder in 1985 to protect the animals from poachers and dwindling habitat. As the Rwandan War began in 1992, the research center was ransacked and the park closed. Until post-World War I Belgian colonization, Hutus and Tutsis coexisted peacefully in small chiefdoms. The Belgian colonizers codified ethnic differences to consolidate their power, creating an apartheid system that backfired during the 1959 independence and beyond. The 1994 genocide was to be an extremist Hutu government’s “final solution” against the Tutsi minority and moderate Hutus reluctant to participate in the slaughter. Between eight hundred thousand to a million people were brutally murdered, most of them with machetes or other crude instruments of torture. Some victims paid their murderers to have their lives ended with bullets instead. Sweeping the Mass Graves at Kigali Genocide Memorial Center, Rwanda from DC Intersections on Vimeo. I learned quickly in Kigali that while I could view bodies of genocide victims through glass windows installed in mass graves at the Kigali Genocide Memorial Centre, few Rwandans openly spoke of the nineties. “Don’t ask anyone if they are Hutu or Tutsi,” I was told again and again. Volcanoes National Park reopened in 1999, in hopes that tourism would revive the economy and heal the country’s broken spirit. 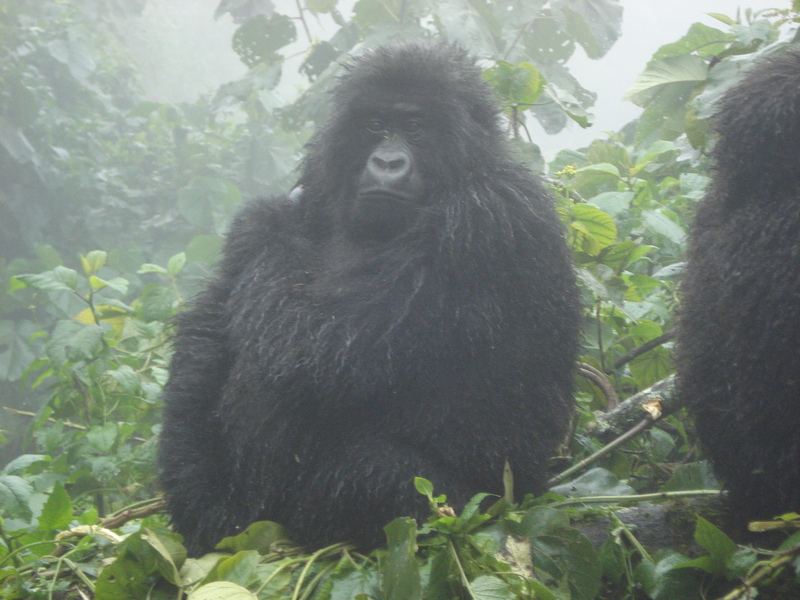 It is one of only two places, Uganda being the other, where tourists can encounter protected mountain gorillas. Before our early-morning trek, we had spent the night at the spartan hotel where Dian Fossey was known to have encamped when she went into town, which became increasingly rare as she became more reclusive toward the end of her life. Had she lived to witness the ransacking of the center she built, the closing of the park, and the horrors of genocide, would she have given up on people for good? The hike up and into the mountains took several hours in an unrelenting rainstorm. We did meet the gorilla group we intended to find, on the shoulder of the mountain. Their blue-black fur, their startlingly human features and gestures, and the sheer size of the group leader, a four-hundred-pound mature male silverback, were awe-inspiring. One of the last gorillas we saw before heading back down the mountain was the group’s younger silverback. Male gorillas become silverbacks upon sexual maturity, though the leader protects his right to exclusively mate with the group’s females. So young silverbacks must either defy the leader and risk injury, or leave and form their own groups. The young silverback’s face was not as mature as the leader’s, his round eyes more visible under his brow ridge. This gave him a quizzical look. I imagined his loneliness, not quite having found his role in the world yet. He turned his head and looked at me—I mean, really stared at me, his bottomless eyes boring through me and not anyone else in our group. Those few seconds felt like forever, and locked in that gaze I felt the ancient animal memory of this gorilla and his ancestors. What had they seen of us, today and in all the days before? I had gotten tenure a month before I arrived in Rwanda. Though this trip was supposed to be a celebration, I couldn’t shake the vague feeling that I may have lost a sense of purpose without the goal looming over me. When that gorilla held me transfixed in his gaze, I knew I wanted to be as present with people in my life. It had been easy, in the past six years, to use my work as a buffer between me and them. I wanted to understand what connections were damaged so irreparably that people systematically hacked other people to pieces, day after day, the death toll amassing at three times the rate of that of Jews during the Holocaust. Gourevitch, the journalist, said he told the terrible stories of the Rwandan genocide because “ignoring them makes me even more uncomfortable about existence and my place in it.” I wanted to know what should not be ignored, here and elsewhere, and how a society moves on after the bodies are buried. Like the young silverback, I wanted to know my role in the world, among my species, and the others that rely on our selfless compassion. In the face of mass graves and a fragile sanctuary that survived the worst of humanity’s inhumanity, so geographically close together, I could think of only one option: to look each other in the eye and see all the beauty and horror within ourselves. 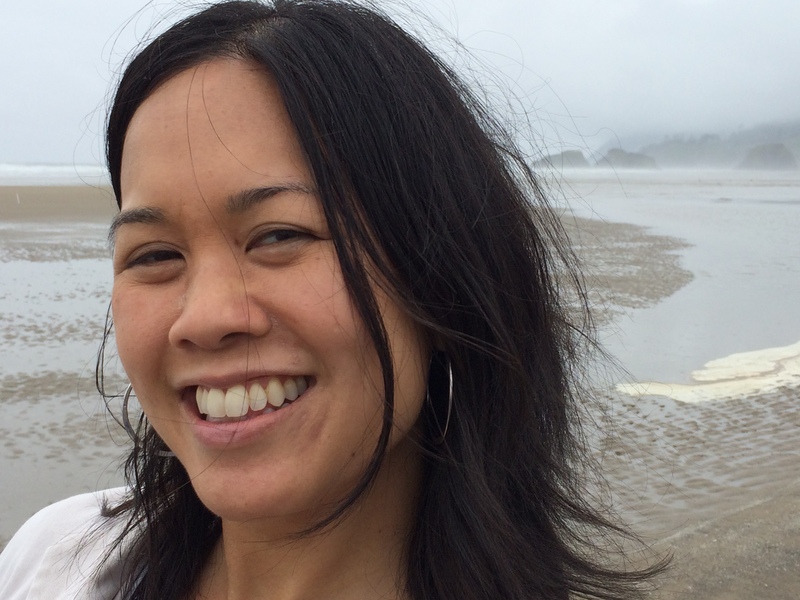 Angie Chuang is a (tenured!) associate professor of journalism at American University School of Communication. Before entering academia in 2007, she was a staff writer at The Oregonian, The Hartford Courant and the Los Angeles Times. Her first book, “The Four Words for Home” (Aquarius Press / Willow Books 2014), just became available on Kindle, as well as on dead trees. She is grateful to George for recruiting her to work at The Oregonian more than 20 years ago, and to photographer Laura Pohl, now a resident of Cape Town, for inviting her to Kigali last summer. Editor’s note: From the moment I met Angie Chuang as a Stanford undergraduate, I knew I was in the presence of someone whose bulb burns brighter than most. I was delighted to recruit her to The Oregonian and watch her evolve, first as a reporter, then as a teacher and now as a published author. Her commitment to diversity in second to none — and she’s plain fun to be around. This entry was tagged dian fossey, mountain gorillas, rwanda, travel, wildlife. Bookmark the permalink. What awe inspiring moments all around. I envy you your visit. I’m glad you went there and found something meaningful to share. I think of Rwanda often and just don’t understand how that kind of thing could have happened, and how they could have put their differences aside and kept on living with each other. Thanks so much for sharing your journey. Thank you, John. I was only there a short time, but it’s a remarkable country for so many reasons. Philip Gourevitch’s books on Rwanda, especially “We Regret to Inform You that Tomorrow We Will Be Killed with Our Families,” are phenomenal and come the closest I’ve read to explaining how colonialism and practices grounded in the European eugenics movement sowed the seeds for the genocide. Dear Angie, I am so proud of you, So proud to know you and your work. Sending love from the Ragdale Kitchen.Chef Linda. Linda!!! I am so sorry I didn’t make it to Ragdale this year but I think about your wonderful presence and food all the time. Thanks for reading and hope you’re doing well. Big hugs. Angie – loved the way you write about your stay in Rawanda. I was there in June and I can say that being inside a Gorilla family’s nest was truly the most spiritual experience I have ever had. I just sat for 10 minutes watching a female chew on the bamboo 3 ft in front of me. Another one took my gloves, sniffed them and took them away – though the trackers brought them back. I had also only heard about Rawanda from the movies. My husband and I saw Gorillas in the Mist at our lodge. Since it was just after our trek, all our sympathies were with Dian Fossey. Kigali felt strangely shell-shocked still. I had read so many reports of the genocide and seen Hotel Rawanda, but nothing prepared me for the horror of the details I saw at the museum – especially the pictures of the children. The healing gardens were great, but there were still visitors mourning and crying at the museum. Rawanda was also so beautiful – so clean and picturesque – Ruhingeri was like a tropical Switzerland. Such a place of contradictions. So great to hear from someone who has been to the same places! Love the story about the gloves. The museum tour was very, very difficult, and I agree that shell-shocked is a fitting descriptor for Kigali, despite being relatively developed and modern. Thanks Angie for this account. There is one phrase that spoke to me deeply; a reminder of something I have always desired: “When that gorilla held me transfixed in his gaze, I knew I wanted to be as present with people in my life”. Our busy lives hijack our connections with people and ofthe transform our gazes as those of fugitives running away from each other! Thank you! It’s a constant challenge for all of us — social media and online distractions like this great blog 🙂 certainly make it even more difficult. Thank you for sharing this personal experience that you entwined with important history that many would prefer to forget. To sit among gorillas in a forest must have been so amazing! Not many people can count this as an experience and that you saw the connections to our shared humanity, and our faults, shows your heart. What an experience. I echo the envy. And the same line Parfait mentioned hit me. Cheers to being present. Cheers to wanting to be present. Angie, you left me awestruck and speechless. Eyes are the portholes to our souls – all souls.